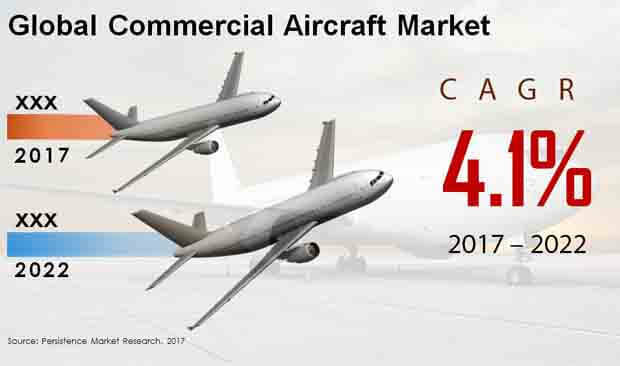 Persistence Market Research has recently published an informative report on the commercial aircrafts market titled ‘Commercial Aircrafts Market Forecast, Trend Analysis & Competition Track – Global Review 2017 to 2022’. Commercial aircraft is that part of civil aviation that includes both jetliners ferrying passengers as well as those aircraft handling cargo. This report provides a forward-looking view of the commercial aircrafts market taking into account relevant factors such as economic growth, demographic characteristics, tourism trends, oil price volatility, and development of different routes or expansion of existing ones. Lastly, the report highlights demand across the commercial aircraft market all the way from narrow-body aircraft to the largest jetliners. The commercial aircrafts market report focuses in detail on the dynamics shaping the commercial aircrafts market i.e. the drivers, restraints, opportunities, and threats. An intensity map plotting the presence of key stakeholders across every region can be expected in this section of the commercial aircrafts market report. The segmented analysis and forecast of the commercial aircrafts market report is included in this section. The commercial aircrafts market has been studied on the basis of region and aircraft type. Cross-segmental data analysis can help the report reader make long-term business decisions. The commercial aircrafts market report begins with the executive summary comprising the historical and projected growth of the commercial aircrafts market. An overview with a concise yet comprehensive definition coupled with the taxonomy follow the executive summary in the commercial aircrafts market report. The commercial aircrafts market report estimates by way of critical metrics such as absolute dollar opportunity, CAGR, and Y-o-Y growth rate are mentioned here. The commercial aircrafts market can be considered an oligopolistic one in which few players dominate and there are substantial barriers to entry as this is a highly-capital intensive market. That is why, a competition analysis is absolutely imperative for both incumbents as well as new entrants seeking to enter the challenging albeit lucrative commercial aircrafts market. The competition dashboard section is perfectly suited to this task. This chapter consists of a brief company description, strategies adopted, recent developments, and key financials of the company. A SWOT analysis concludes this section of the commercial aircrafts market report and is quite beneficial for formulating long-term investment plans in the commercial aircrafts market. In the commercial aircrafts market report, an equal amount of emphasis has been given to both developed and emerging economies as these are the markets of the present and future respectively. The developed regions are North America, Europe, and Japan, while the rest are MEA, APEJ, and Latin America. A historical analysis of the largest countries within each region has been mentioned and this has been compared and contrasted with the potential that lies ahead in the commercial aircrafts market throughout the duration of the forecast period. Companies that want to target certain geographies with the highest growth potential are advised to thoroughly peruse this section of the commercial aircrafts market report. Commercial aircraft are those aircraft that ferry millions of passengers from one corner of the globe to the other in a matter of hours or those that transport huge volumes of cargo. Commercial aviation boomed after the Second World War with the beginnings largely attributed to ex-military aircraft being crudely modified to transport cargo or passengers. Modern day commercial aircraft have come a long way since and thus Persistence Market Research felt the need to research the commercial aircraft market in its upcoming report. The commercial aircraft market is expected to surge past a value of US$ 330 billion by the end of the forecast period. Narrow body aircraft had a revenue share approaching half of the commercial aircraft market in 2017 and are unlikely to cede this commanding position anytime soon. A greater trend in the aviation industry seems to be ferrying fewer passengers from tier 2 and tier 3 cities as opposed to carrying larger numbers from centrally located metropolitan hubs. Narrow body aircraft are predicted to be the biggest beneficiary of this and the North America narrow body aircraft market is poised to be worth approx. US$ 45 billion by the end of 2022. Wide body aircraft are no longer as popular as they once were in the commercial aircraft market and are rapidly losing their appeal on account of numerous factors detailed in the report. Wide body aircraft are predicted to record a sluggish CAGR of less than 3.5% during the period from 2017 to 2022, necessitating appropriate strategies to be successful in this segment of the commercial aircraft market. Key stakeholders in the commercial aircraft market would be advised to focus their attention on the highly populous and fast-growing APEJ region as the continent can safely be considered the saving grace of the wide-body aircraft segment. Regional jets have a revenue share slightly lower than that of wide-body aircraft in the commercial aircraft market. Nonetheless, companies should not ignore this segment entirely as an absolute dollar opportunity of just under US$ 10 billion is waiting to be tapped in this segment of the commercial aircraft market. Along with North America, regional jets have strong appeal in Europe and companies are recommended to take this into account while devising their long-term strategies. The two regions that undoubtedly hold the greatest potential in the commercial aircraft market are North America and APEJ. While the former has a well-developed road infrastructure, it has minimal rail connectivity and a vast landscape, compelling travelers to fly if they need to travel from coast to coast. The companies profiled by Persistence Market Research in the commercial aircraft market report are The Boeing Co., Airbus SE, Embraer SA, Bombardier, Textron, Dassault Aviation, General Dynamics Corporation, Piaggio Aero Industries, Pilatus Aircraft Ltd., and Avions de transport regional.